Chad Mirkin, the George B. Rathmann Professor of Chemistry at the Weinberg College of Arts and Sciences and director of Northwestern’s International Institute for Nanotechnology, invented the spherical nucleic acids used in the investigational drug. The new drug is able to cross the challenging blood-brain barrier to reach tumors in animals, where it turns down a critical cancer-causing gene. Now, the Phase 0 clinical trial will investigate the drug’s ability to reach tumors in humans. The glioblastoma drug represents a revolutionary new class of drugs. The novel spherical nucleic acid platform it is based on can be applied to other types of neurological diseases, such as Alzheimer’s and Parkinson’s, by similarly turning down the genes that lead to those diseases. It’s highly unusual for a drug to be developed in preclinical research at a university, shepherded through FDA approval as an investigational new drug and studied in a clinical trial — all within the same university and without funding from a pharmaceutical company. In most cases, a drug is developed and licensed to a pharmaceutical company. 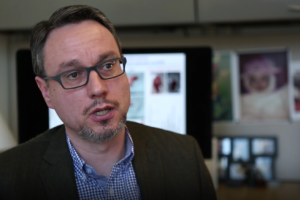 Alexander Stegh, assistant professor of Neurology, was one of the scientists who developed the drug, and was the senior author of a pivotal 2013 study that led to human trials. “We know this drug works in mice. Now we need to know if it can cross the human blood-brain barrier and accumulate in the tumor of a human being,” said Alexander Stegh, PhD, assistant professor of Neurology in the Division of Neuro-oncology. 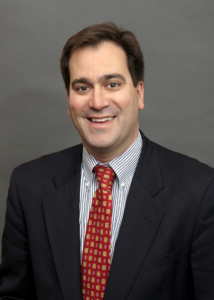 Stegh developed the drug with Chad Mirkin, PhD, the George B. Rathmann Professor of Chemistry at the Weinberg College of Arts and Sciences, a professor of Medicine in the Division of Hematology and Oncology, and director of Northwestern’s International Institute for Nanotechnology (IIN). “We desperately need an effective treatment for this deadly disease,” said Priya Kumthekar, MD ’11 ’12 GME, assistant professor of Neurology in the Division of Neuro-oncology and of Medicine in the Division of Hematology and Oncology. Kumthekar, also a Northwestern Medicine neuro-oncologist, is the lead investigator of the Northwestern trial, which will recruit six to eight glioblastoma patients. The study will recruit individuals who have had regrowth of their tumors and are candidates for tumor removal. They will receive the drug intravenously prior to surgery. Following tumor removal, Kumthekar and her team will study the tumor’s drug content to determine how well the drug crossed the blood-brain barrier in patients. “This was a complex, meticulous process requiring intense collaboration across many facets and groups within the University and Northwestern Medicine,” noted Ann Adams, associate vice president for Research at Northwestern and one of the quarterbacks who led the FDA application process with Giles and Caroline Ko, PhD, a research associate in the department of Chemistry and chief scientific officer of the IIN. “The technology of spherical nucleic acids used in this first-in-human study is very powerful and may result in new, more effective approaches for the treatment of brain tumors and possibly other tumors in the future,” said Leonidas Platanias, MD, PhD, the director of the Lurie Cancer Center, and the Jesse, Sara, Andrew, Abigail, Benjamin and Elizabeth Lurie Professor of Oncology. Stegh and Mirkin have been collaborating since 2009 to tackle the difficult problem of developing better treatments for glioblastoma. They first came together through Northwestern’s Center of Cancer Nanotechnology Excellence, funded by the National Cancer Institute. Mirkin had the perfect tool: spherical nucleic acids, new globular forms of DNA and RNA — rather than linear — which are nontoxic to humans. The nucleic acid sequence is designed to match the target gene. Stegh had the gene: in 2007, he and colleagues identified the gene BCL2L12 as one that is overexpressed in glioblastoma tumors and related to glioblastoma’s resistance to conventional therapies. The therapeutic, because of its novel structure, is actively taken across the blood-brain barrier, allowing it to reach the brain tumor. Once inside cancer cells, the drug silences the disease-causing gene. The RNA’s programmed sequence acts as a dimmer switch, selectively impeding the cells from producing specific proteins related to the disease. The result is selective cancer cell death and reduced cell growth. Key to the drug’s success is the nanostructure’s 3-D spherical shape and nucleic acid density. Normal (linear) nucleic acids cannot get into cells or cross the blood-brain barrier, but these spherical nucleic acids can. Strands of RNA attach to and surround a gold nanoparticle like a shell; the nucleic acids are densely packed and form a tiny sphere. The gold nanoparticle core is only 13 nanometers in diameter. The survival rate of the animals increased nearly 20 percent, and tumor size was reduced three- to four-fold, as compared to the control group. Mirkin also is a professor of chemical and biological engineering, biomedical engineering and materials science and engineering. Editor’s note: Northwestern University and some of the investigators involved in the development of the drug have financial interests relative to the drug used in this research study. As a result of these interests, Northwestern University and/or some investigators could ultimately benefit financially from the outcomes of this research.